Head the oven to a medium temperature. Boil a large pan of water and blanch the peaches for up to three minutes. Drain and then pat dry. Place the caster sugar into a saucepan and heat until a caramel forms. Add in peaches, orange juice, maple syrup and rum then simmer for two minutes. 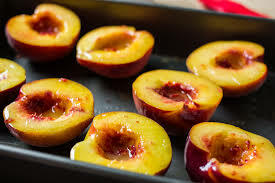 Place the peaches on an ovenproof dish and then bake for five minutes. For added taste, serve the peaches with nonfat frozen yoghurt.